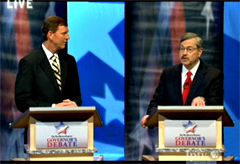 Bob Vander Plaats and Terry Branstad (L-R) during debate. The final debate among the three Republicans who’re running for governor was held yesterday, and the 16-year record of former Republican Governor Terry Branstad was a primary focus. Branstad is seeking a fifth term this year and Republican rival Bob Vander Plaats questioned Branstad’s record on taxes and spending. The candidates were asked about a wide-range of issues, from road repairs to illegal immigration. All three said if they are elected governor, they’d push for a law that would require women seeking an abortion to view an ultrasound first. Governor Chet Culver, a Democrat, has pledged to “fight” for abortion rights if he’s reelected this fall. Roberts said abortion will be a major issue in the general election because people hold “strong views” on both sides of the debate. And Branstad pointed out there’s a judicial nominating commission that presents two names to the governor when there’s a vacancy on the court and governors must choose one of those people. You can watch the debate online at www.iptv.org or www.DesMoinesRegister.com, the two organizations which sponsored yesterday’s debate. Read more about the debate here, or check out the Radio Iowa blog post with a more detailed review of the debate.